Toyota Fortuner, the top-notch entry-level luxury SUV comprises exceptional road mannerisms and comes equipped with top rated instruments. Introduced in 2005, this mid-size SUV adapts Toyota’s Hilux platform and its sale is developing incredibly in the auto market of Asia and South America. l Reflecting a boxy design, the new Toyota Fortuner with significant ground clearance allows you to experience a comfortable ride. l Its headlamp console and chrome finished bold grille grants it a masculine, yet elegant style. l The large bonnet of this car is embedded with air scoop making the powerful SUV look more aggressive. l Its 17 inch rims coupled with 265/65 R17 tubeless radials gives it side profile a sporty appeal. l The exterior dimensions of this car stand out to be 4705 mm x 1840 mm 1850 mm (L X W X H) and the wheelbase is about 2750 mm. 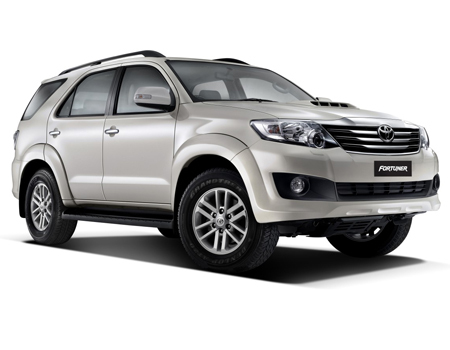 What to opt for: Toyota Fortuner is one of the premium SUVs in Indian market and it comes fitted with exclusive exterior package, thus getting an insurance for the complete vehicle including its additional parts would be great choice. l The entry-level luxury SUV integrated with lots of equipments make you explore the world with an adventurous touch. l In terms of entertainment, this car has got 2-DIN stereo system along with touch-screen display filling your ride with soothing music. l Air-conditioner employed with climate control maintains the temperature of cabin, while providing superior comfort to the occupants. l This SUV comes fitted with power steering that comprises number of controls focusing on driver’s convenience. l Provided with 286 litres of boot space, the new Fortuner shows off its utility factor. What to opt for: This upmarket SUV wraps plenty of high-end aspects in its cocoon, so you can insure all the aspects of this car for maximum peace of mind. For its advanced consumables, the additional add-ons are also available. The ultimate entry-level luxury SUV by Toyota, is complemented with its power engines and boosts brand’s legendary reliability. In Indian auto market, this car competes with Mitsubishi Pajero, Ford Endeavor and the luxury car Mercedes Benz GLA-Class. Being a luxury SUV, maintenance cost and parts cost are pretty unreasonable, thus getting an insurance for your complete vehicle would be a brilliant choice, along with liable and collision coverages.